The Aruba hurricane season in September and October is usually mild because the island lies on the southern edge of the hurricane belt. Average rainfall is 2-3 inches a month. Lying on the edge of the hurricane belt means that this warm and arid tropical island just off the coast of Venezuela avoids most hurricanes and tropical storms -- but not all of them. 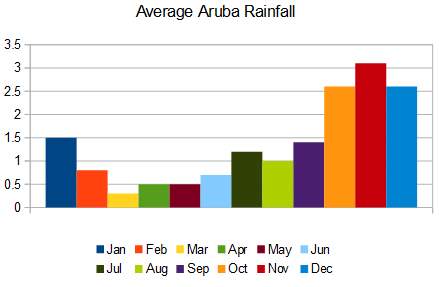 Over a recent 30-year history, Aruba averaged only about one inch of rain and sometimes less each month of the year from January through August, according to the Meteorological Service of Netherlands Antilles and Aruba. But rain starts to climb in September during the peak months of the Caribbean hurricane season, which officially begins on June 1 and ends on Nov. 30 each year. Rainfall averages less than two inches in September and more than three inches in October, November and December. “Climatic records show that merely 15 tropical cyclones (TC) (Tropical Storms up to Category 5 Hurricanes) passed near the islands of Aruba, Curaçao and Bonaire within a distance of 120 nautical miles on either the southern or northern side of the islands during the period 1851-2009,” the meteorological service says. On average, a hurricane causing severe damage passes over or near the ABC islands every 100 years. The increase in rain from October through December is the result of increased storm activity in the Caribbean. Aruba receives fringe effects. Hurricane Ivan in 2004 passed about 80 miles north of Aruba in early September that year. Despite the hurricane strength, the island received about 2.5 inches of rain and winds at 40-50 miles per hour for a brief period of time. Of all the major Caribbean destinations, Aruba and its neighbors Bonaire and Curacao are the least likely to feel the impact of the annual hurricane season. But there are never any guarantees. The odds of bad weather are much lower for Aruba from January through August, but visitors who have a compelling reason to go in the fall will most likely face odds that are only slightly worse. Although the hurricane season officially runs from June to November, the highest level of activity in the region goes from mid-August to mid-October. The most active time is mid-September. Recent hurricanes that passed near Aruba include Ivan in September 2004, Emily in July 2005 and Felix in late August and early September of 2007. All three passed 60 miles or more away from the island, produced heavy rains and high winds, but caused minimal damage. The average high temperature in Aruba from June through November is 90 degrees Fahrenheit or about 32 Celsius, the meteorological service says. The increase in rainfall does not impact the temperatures during the peak rainy season months of October and November. The average highs drop to 87 Fahrenheit or 31 Celsius in December.